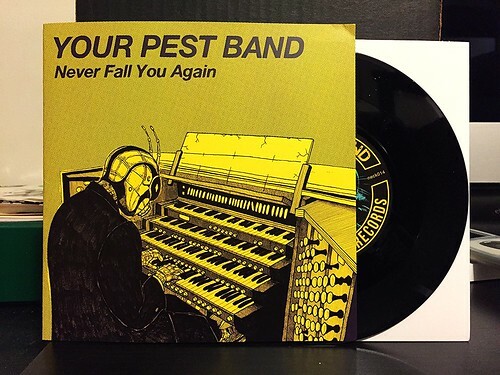 I Buy Way Too Many Records Dot Com: Your Pest Band - Never Fall You Again 7"
I've been a huge fan of the Snuffy Smile(s) record label for decades at this point. They've released records by some of my very favorite bands of all time. But of all the bands to spring from that fertile scene in Japan, I have never seen one as prolific as Your Pest Band. These guys put out so many records it's actually difficult to keep up at times. In addition to the sheer number of records they release, the myriad of different styles they manage to incorporate into their songs is kind of nuts. This wonderful 7" on Brassneck records is a great example of Your Pest Band in a nutshell. The record starts off with "Never Fall You Again," a slower paced song with liberal use of a keyboard melody that accentuates the earnest vocals. On the surface it may seem like an odd song for Your Pest Band, but the way it's recorded and the sounds they are able to capture makes it fit right in with their prior work. We then move on to "Escape" which is much more of a traditional upbeat and catchy punk rock ripper. When Your Pest Band unleashes a song like this, they do it better than almost any band I can think of. There's a certain strain of punk rock that Japanese bands have perfected and this is a shining example of that. The 7" closes with "You Fit." With its bouncy rhythm section and shining acoustic guitar, it almost has something of a Tom Petty sound to it. It's impressive the way the band can put out a 7" with three absolutely different songs, but yet they all manage to compliment each other and all sound unquestionably like Your Pest Band.